I missed this AFA Symposium news in the wake of all the buzz and tears being shed over the possible retirement of the A-10. Bill Sweetman kinda’ buries the lede in a story about the CUDA missile concept. Getting past the cute “Halfraam” moniker, the REAL news here seems to be there appears to be an ‘extended range’ version in the mix. On show for the first time at AFA is a model of Lockheed Martin’s Cuda, a so-called “Halfraam” weapon about half as long as an Amraam [sic] and compact enough to fit six missiles into each bay of the F-35 or F-22. 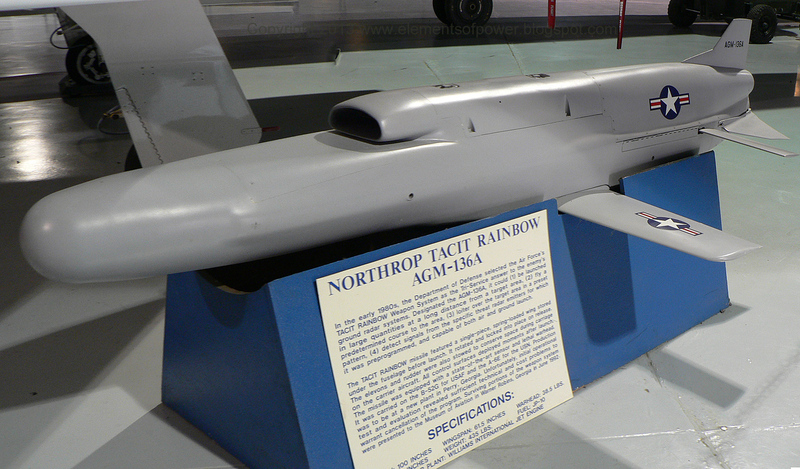 Cuda draws on the hit-to-kill technology used on the PAC-3 missile, is designed to have a radar seeker and has both movable tails and forward attitude control motors for high agility. 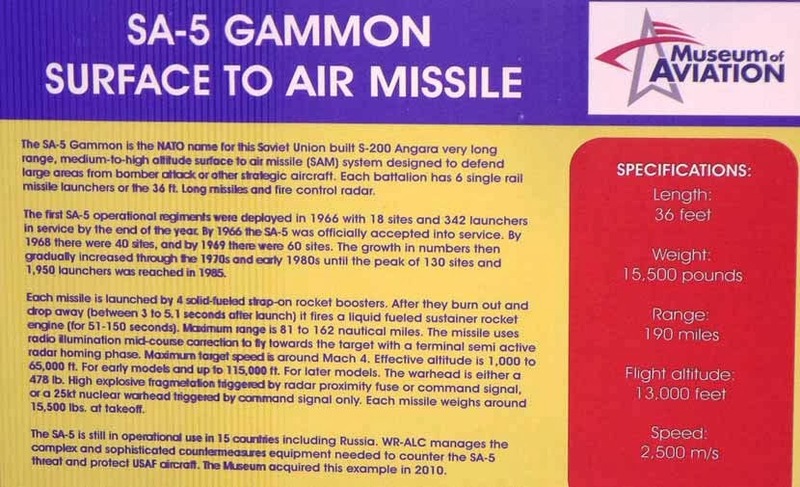 The company is not disclosing Cuda’s design range, but one variation of the concept is a two-stage missile with a similar total length to Amraam [sic], presumably with the goal of covering a wide range envelope with a single missile design. Extended Range CUDA? Here's one possibility in a universe full of them. The world awaits further details. We tackled the ‘big’ myths in a while back Parts 1-6. This post, at the root of things, is about the little myth that if the Air Force retires the A-10, that somehow means the Air Force doesn’t care about the mission, the Army, or both. I believe it is based upon other little myths that are sometimes based upon big lies and/or uniformed opinions more than anything else. The lies and opinions get planted as ‘fact’ in places where they line up neatly with already well-entrenched points of view. Then over time, if they get repeated often enough, they become ‘facts’… that aren’t. With the F-35 coming online to take over the close-air support role, the venerable Thunderbolt II will be a likely target, Gen. Mike Hostage told reporters at the Air Force Association's Air and Space Conference. “This is not something I want to do,” Hostage said, explaining that no decisions had been made. Hostage said he had already talked to Army officials about losing the A-10 and using other jets to take over the close-air support role. The Army was “not happy” about the possibility, Hostage said. Hostage said the service can do the close-air support role with the F-35, but it would be more expensive and “not as impressive” without the famous GAU-8 Avenger 30 millimeter gun. “In a perfect world, I would have 1,000 A-10s,” Hostage said. “I can’t afford it. I can’t afford the fleet I have now. If I cut the fleet in half, do I save enough to get through this problem? Hostage’s comments follow similar statements from both acting Secretary of the Air Force Eric Fanning and Chief of Staff Gen. Mark Welsh that single-mission aircraft would need to be cut if budgets continue to decrease. What is facing the Air Force right now is same for all the services: they must plan on doing ‘less with less’ because of the current ‘budget reality’ [Though it is arguable that is really about a lack of defense-as-a-national-priority ‘reality’]. Within the framework of the ‘budget reality’, the services have to figure out how can they fulfill as many of their responsibilities, and to what extent, with the ‘less’ budget they will be left to work with going forward. Got that? Retire selected weapon systems and save all the capability (“everything I do”). This is certain to cause a groundswell of emotion and irrational fear in some quarters if the A-10 fleet is forcibly retired. 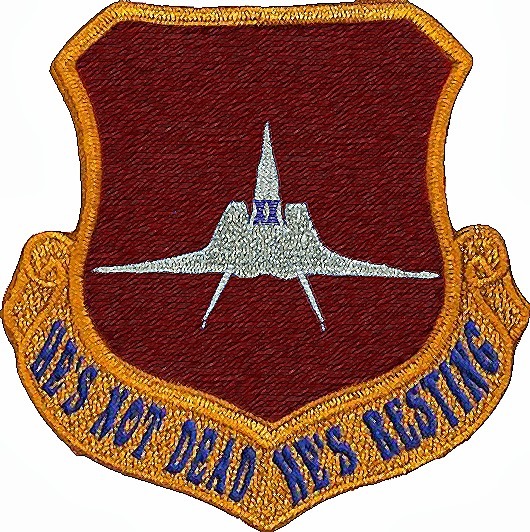 I would say ‘retired early’ but that would be less correct than stating ‘earlier than planned’, as we have kept the A-10 past it’s freshness date. the A-10 was considered as rapidly obsolescing AND rapidly aging when the Air Force first proposed replacing it with A-7Fs and A-16's the first time in the late 1980's. All but the last A-10s built (~1983-84) were manufactured with known deficiency in structural strength to begin with. A-10s in AMARG: The Largest Supply Source for Keeping Operational A-10s Flying. "...fourteen airplanes sitting on the ramp having battle damage repaired, and I lost two A-10s in one day..."
Tales of the A-10's effectiveness in Desert Storm overshadowed it's shortcomings, which no one wanted to talk about (see Gen Horner's observations in Part 6 of this Debunking CAS Myths Series ) . Between Desert Storm and Congressional dabbling in matters they did not understand, the A-10 got a reprieve. The reprieve has lasted this long because we have not had to fight a war like Desert Storm again (Yes, there were significant differences between then and Operations Allied Force, Enduring Freedom and Iraqi Freedom). Once again, there will be the ubiquitous ‘some’ who will complain that the AF is abandoning the needs of the Army by abandoning the Close Air Support (CAS) mission. In reality, the complaint will/would be over little more than a ‘hardware’ and ‘tactics’ change in the mission, NOT a retreat from the mission itself. Let us note here, that such complaints ignore the fact that the current plan already has the F-35 replacing the A-10 in the CAS role. If the A-10 fleet is retired due to sequestration, then sequestration is only causing a change in schedule for something that was going to happen anyway and NOT changing an inevitable end-state (not that changes themselves are good things, they usually cause chaos and added costs themselves). With this emerging probability that the A-10s will finally be retired, we can expect a repeat of past experience: someone (or rather, many someones) will, in their ignorance, decry such a move as yet another example of the Air Force trying to get rid of the A-10 ‘they never wanted’ in the first place. Never mind that the reason for retiring the A-10 is clearly articulated in the present time: In the future the mythology will be that it was just another exhibit of ‘proof’ that the Air Force has ‘never wanted the A-10’ or never ‘took CAS seriously’. One in a laundry list of other examples. The problem is that laundry list, is a list of myths as well: a compendium of untruths, perversions of the truth, and biased opinions promoting a theme masquerading as the truth. And I can back up my claims with hard evidence. To me, one of the most annoying myths about the Air Force and the A-10 is the one that asserts that when the AH-56 Cheyenne program was cancelled, the Air Force “tried to back out of the A-10 commitment” but it was “made” to keep it by some greater outside force, See "Close Air Support: Why all the Fuss?" (Garrett, P.10) . I’ve picked the ‘Garrett’ (Thomas W. Garrett) reference to use as a starting point for a few reasons. First, when he stays away from the politics involved and deals strictly with the whys and wherefores of the logical division of responsibilities and missions between the Army and the Air Force, the paper is quite admirable. (His snarky delivery however, which no doubt raises a chuckle or two in Army quarters, comes across as snide and mean-spirited in its essence when experienced by this Airman.) Second, He reprised his War College paper in the Army War College quarterly Parameters under a different title (Close Air Support: Which Way Do We Go) . Over a dozen papers written later directly cite these two Garrett papers, and even more papers spring from these. Third, the paper was written shortly before Desert Storm when Garrett was a Lt. Colonel. Later in Desert Storm “he commanded, trained and led the 101st Airborne Division (Air Assault) Aviation Brigade, the largest Army Aviation rotary wing task force in conventional land warfare history”. 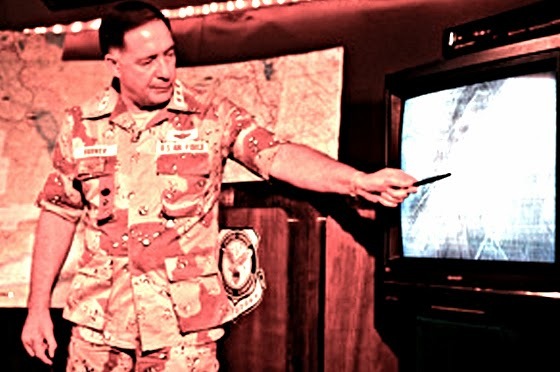 Garrett also served in Vietnam, retired as a Major General, and has been inducted into the Army Aviation Hall of Fame, so he has sufficient ‘street cred’ to be a reliable reference on this topic. Myth: The Air Force Tried to Kill the A-10 After the AH-56 Cheyenne Program was Cancelled. Horton and David Halperin, "The Key West Key," Foreign Relations. Winter 1983-1981, pp. 117. The Army next tried to build the Cheyenne, a large antitank helicopter priced at $8 million. This time the Air Force feared that the Army, with its new weapon, might be able to acquire officially the close-support function. While the Air Force still had no interest in providing close support, it wanted to protect its bureaucratic territory. Thus it developed the Fairchild A-10, which Easterbrook notes, "many aircraft observers believe is one of the best planes ever built." 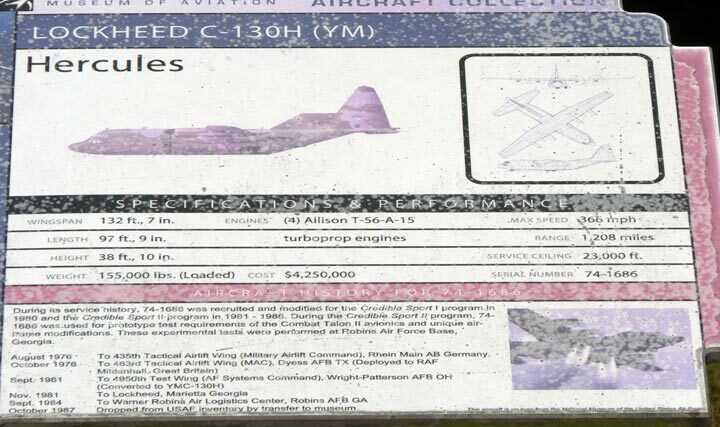 And priced at $3 million, the A-10 could do a far better job than the Cheyenne at less than one-half the cost. The Cheyenne was canceled. But having headed off the Army, the Air Force saw no further use for the A-10 and attempted to cut the plane from its budget. Congress has insisted that the A-10s be built. But Air Force reluctance has sent the Army back to the drawing board, once again in the no-win realm of the helicopter. There’s A LOT wrong with the above besides the claim the Air Force tried to ‘back out’ of the A-10, such as tying what would become development of the AH-64 Apache to some sort of Air Force ‘reluctance’ ‘Halperin x 2’ were apparently unaware the Army began pursuing what would become the AH-64 the day after the Cheyenne was cancelled. The Air Force was fast in those days, but it wasn’t that fast. The Army simply went back to the drawing board trying to replace perhaps the longest-lived interim system ever: the AH-1 Huey Cobra. But we’ll let the niggling things slide and keep our focus on the task at hand. First, who were the authors of this ‘article’ and who was this ‘Easterbrook’ they were citing? Around that time including before and after, Morton Halperin was the Director of the Center for National Security Studies, on the board of the ALCU, and a Brookings Institute ‘scholar’. He was nominated to be THE ASSISTANT SECRETARY OF DEFENSE FOR DEMOCRACY AND PEACEKEEPING under Les Aspin (Spit!). When nominated in 1993, he was a very well known ‘quantity’. It did not go well. The other ‘Halperin’ was his son David, then a senior at Yale, and he has not fallen very far from the tree. By the way, Nowadays ole’ Morton is running George Soros’ Open Society Institute. So one might file this data away for future consideration: Perhaps this Father-Son duo were/are not that keen on defense in the first place? The Washington Monthly was founded in 1969 on the notion that a handful of plucky young writers and editors, armed with an honest desire to make government work and a willingness to ask uncomfortable questions, could tell the story of what really matters in Washington better than a roomful of Beltway insiders at a Georgetown dinner party. In our cluttered little downtown DC office, we’re still doing what we have done for over forty years, and what fewer and fewer publications do today: telling fascinating, deeply reported stories about the ideas and characters that animate America’s government. When you get right down to it, the Washington Monthly is a political ‘alternative’ news outlet. It has been largely run, and overrun, by people like James Fallows whose merits I briefly noted in a sidebar here. So file that away for future consideration as well. 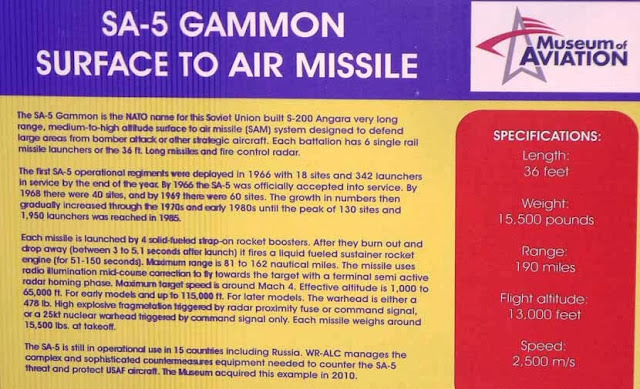 Asserting the Air Force with a penchant for technology was requiring an expensive unnecessary “smart bomb” called the AGM-65 be carried on top of the internal 30mm gun. Laughably describing the Maverick as having only a “15%” probability of kill per “pass” and being impossible to operate effectively in combat. Making baseless claims that the Air Force Chief of Staff only pursued the A-10 because of the Army's Cheyenne. Citing James Fallows’ writings criticizing the TOW missile, and mocking the idea that the next missile in the works, the Hellfire in combination with the “Son of Cheyenne” (AH-64 Apache) will be any better. Among many, many other transgressions against logic and truth. ALL the above is patently, and demonstrably untrue. All of it. Beside there being no evidence of ‘anti-close-support’ generals in the Air Force (names? ), the ‘tried to cut the A-10 from its budget’ isn’t supported by the history either. I know from a personal friend that briefed the AF budget to Members of Congress (Circa 78-79) that there was constant pressure to increase the original objective of 600 planes to something greater. The numbers WERE increased, because they had to be: just to get the budget past a Committee Chairman or two. Three years after this article was published, at the end of production there were 715 A-10s. So yeah, after the Air Force got all they originally wanted, MAYBE then they stopped asking for more. So what? --Even though the A-10 is being procured under a concept designed to eliminate the need for depot overhaul, the Air Force is still using a 10-percent factor to justify the purchase of 61 A-10 aircraft for maintenance float purposes. --While Air Force criteria also allows substitutes for aircraft undergoing modifications, the full extent of the modification program for the A-10 is not known. --In developing the lo-percent maintenance float factor Defense has not systematically determined how quickly aircraft In the depot could be "buttoned up" and returned to their units under a wartime compressed work schedule and the influence of this rapid return on the requirements for maintenance float aircraft. Funny how we never hear about this little development, eh? Congress' "watchdog" complains about too many A-10s one year, and a drive-by journalist hammers you the next. Such is life. Finally, everyone and anyone who has ever played the 'budget game' knows that if someone up the chain is going to support buying system X, whether you want it or not, you can let that someone spend political capital getting more of system X, so you can spend it on system Y. Congress makes the rules, everyone else just plays the game. If the Air Force ever chose to reduce numbers of the A-10 to be bought in an annual budget, it was part of a larger strategy. As to the characterization the Air Force “shunted” A-10’s to reserve units, and doing so was 'without precedent', the A-10 WAS the first ‘front-line’ system to go directly to reserve units, but hardly the ‘last’. The year after this article was printed, it was announced that the first F-16s would be going to reserve units beginning in 1984. I presume it would be Easterbrook’s argument that the F-16 was ‘shunted’ as well? My damning counterargument to any accusations that anybody in the Air Force was ‘shunting’ anything would be to point to a little thing we (the Air Force) had going on with a full head of steam at the time: Making Total Force a viable force. I don’t think you have to be much of a detective to read between the lines for Easterbrook’s sources. Aside from referencing Fallows, I see some of the same verbiage that’s been thrown around by Pierre Sprey and Winslow Wheeler for years. I also don’t find it much of a coincidence that this article found it’s way into a particular compendium of lunacy, a copy of which I own. A little book of perversions produced by the predecessor to Project on Government Oversight (POGO) in 1983; the much more verbose “Fund for Constitutional Government”, under their so-called “Project on Military Procurement”. The title? 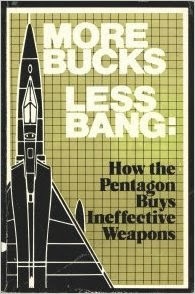 “More Bucks: Less Bang: How the Pentagon Buys Ineffective Weapons” (If you buy a copy for goodness sake buy a used copy will you?). In this little (in more ways than one) book many weapon systems come under fire. I would say there were only 3 ‘reports’ (out of 30+) that I would call 'materially accurate'. One of those was written post facto: about the tribulations of the by-then long-fielded M-16 so it doesn't count as 'prophetic'. The rest? Among all the other tall tales, written by a who's who of muckrakers, activists, and 'reformers', we learn that the Trident submarine and Aegis Cruisers won’t work, the Stealth Bomber is a ‘joke’, Low Probability of Intercept Radar is a ‘homing beacon’, the Abrams and Bradley are failures, and the Maverick, Pershing and Tomahawk missiles will be useless. I suspect Easterbrook was spoon-fed his article’s scary parts from the so called ‘reformer’ camp. His output then later gets rolled into the Reformer Noise Machine which then echoes down the years. Lather. Rinse. Repeat. That is how these myths are born. I further suspect the next thread I pull will lead me right to the same noisemakers as I found this time. 'The Air Force only started/proceeded with the A-X/A-10 because they 'had to' due to external pressure. Note: I'm having formatting (font and case mostly, with some copy/paste gaps) issues with Blogger on this post for some reasons. Please bear with me as I find problems and make adjustments. In the competition to procure a new South Korean fighter to replace their rapidly obsolescing F-4s and F-5s, push came to shove, and military requirements trumped costs. It is a "No Decision"
... Boeing tried to highlight its conformal weapons bay as one of the key radar-evading features, but it failed to quell questions over its capability against F-35, which is originally designed as a stealth jet. With Boeing, the 'Parrot' is never REALLY dead, "it's just pining for the fjords". Boeing's big problem with the Silent Eagle now is other possible shoppers will be asking themselves :What does South Korea know about the F-35 and F-15SE that we don't? Admin Note: To cut down on possible flaming by 'F-15 Fanboys' and 'F-35 Haters', if you want to assert the F-15 deal was scuttled for reasons other than those the South Koreans have stated in the comments, fine --bring evidence to back it up at the same time. If not...'Snip'. (you can go libel people someplace else). 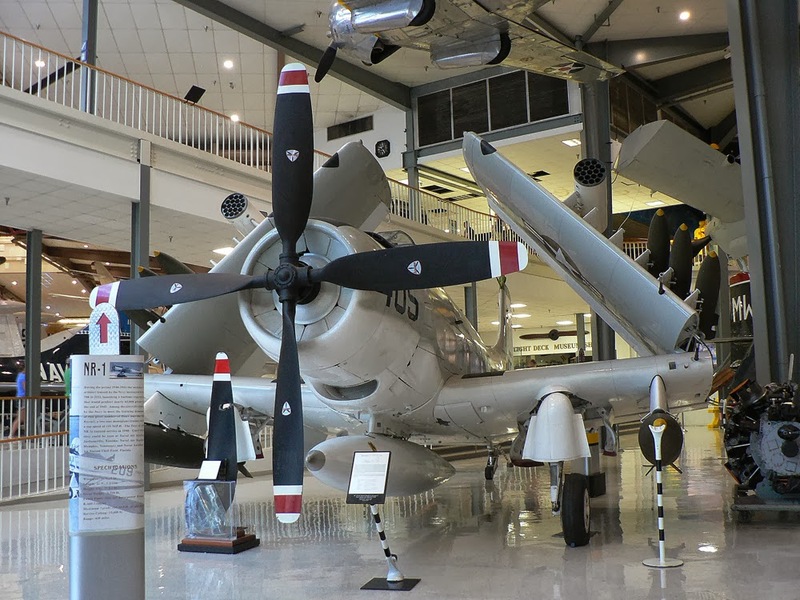 As a change of pace, and to allow me time to do some research on a major project I have going right now, I thought we'd get away from the daily grind of smacking down "F-35 Hater" stories and post a series of travel pics from some various museums I've visited in the last year. The Navy obtained six Camels after WWI for experiments performed at Guantanamo Bay, Cuba, operating planes aboard ship using wooden platforms built over the forward turret guns of battleships. 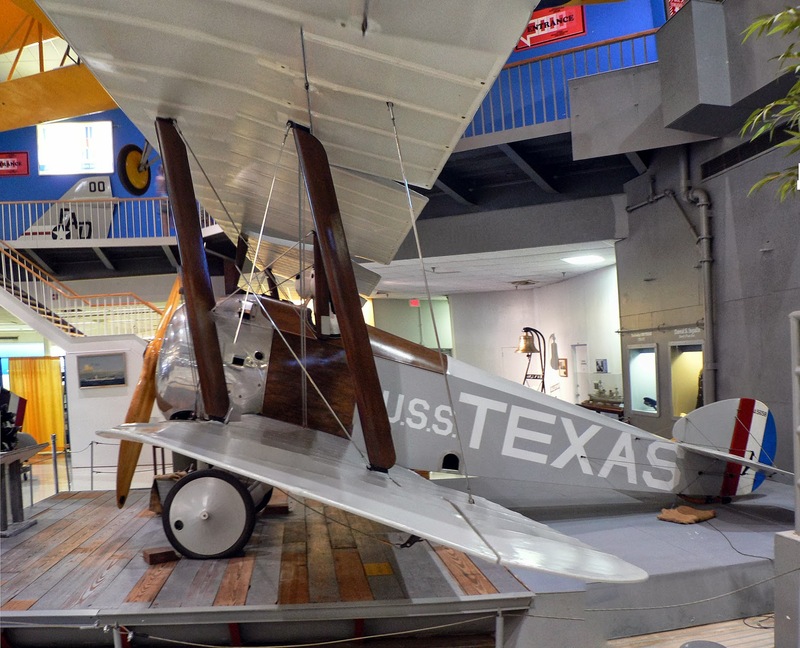 this plane has markings replicating those of a Camel operating off the Battleship TEXAS. Normally, launched aircraft were flown ashore, but were also equipped with inflatable air bags underneath the wings to keep the aircraft afloat in the event of a water landing. I really enjoy dioramas like this one. The museum has a great full-size 'cutaway' display of a PBY. Can you imagine loooong patrols with the engines (hopefully) droning? I never knew about the 'penthouse' station at the wing attachment point. They had a few different versions of the 'SPAD' on display. Note here and elsewhere the tail-hooks of planes past used for sign stanchions. This highlights another great thing about this museum: the ability to get close to the exhibits and REALLY see them. In reality, this is an Air Force T-33 modified to replicate a TV-2. The Navy acquired quite a few of the TV-2s as their first jet trainer, so it is kind of surprising they didn't have a real one available to display. How'd you like to have to polish it while asea? When the Navy shut down operations at Subic Bay, the museum requested some mementos for posterity. What they got was the whole bar, now the museum's restaurant. Food was good, reasonably priced and the atmosphere priceless. Some reporter is buying into and spreading Andrew Bacevich's call for the return of the draft/universal service. It has been my experience that when this unhinged call for the return of the draft and 'universal' service comes from a Veteran, it invariably comes from draft-era Veterans, almost certainly Army, and usually sporting an advanced liberal-arts degree: all pinin' for those egalitarian days of yore... that never were. I enlisted in 1972 at 18, when they were only drafting 19 year olds and up. I entered into an Air Force full of people who didn't want to be there but they were there because they REALLY didn't want to be in the Army. I can't describe how much better it was being in the Air Force after all the draftees who didn't want to be there left. good unit cohesion, high esprit de corps, and generally all around good times, with a miniscule fraction of the number of problem-children, for 20 years --right on through Desert Storm and early Somalia when I retired. NOBODY who ever served in both a draft-era and post-draft era military misses the former. Cucolo wasn't there - he hasn't a clue. Which brings us to the 800-pound Gorilla in the room that is REALLY bothering guys like Bacevich: What they really lament deep down in their gut is that those from their neck of the political woods, all the so-called 'elites' (actually self-proclaimed 'exclusives' IMHO) DON'T feel the call to service themselves. So instead of promoting the "everybody in the pool" mentality that will make everyone unhappy, he needs to start finding a fix to the 'wrong' of a political class that by and large does not feel a 'call' to duty of any kind. If there is a gulf between the military and community where you live, chances are you are in a Blue State or a nice big Blue City. Given that most of the military come from the 'Red' states (and Southern ones at that), the problem isn't about the communities where most of the military come from, it's about those who don't join, where they live and WHY they don't. Bacevich's call for universal service falls under what I like to refer to as the Dogbert School of Thought, AKA the 'Dorky Pants Solution'. Bacevich calls himself a Conservative, because y' know, nothing screams 'Conservative' like COMPULSORY SERVICE.(/sarc). That boy's got a Fascist streak eating away at him that I can't abide. 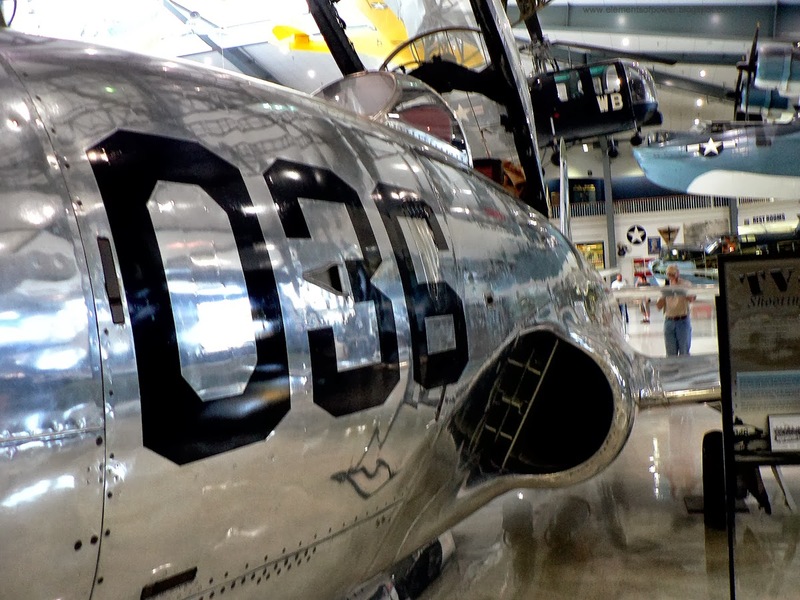 Here's a few pics, including panoramas I constructed out of multiple photo shots of the Robins AFB Museum in Georgia. These displays are all restored by, and the museum staffed by volunteers. 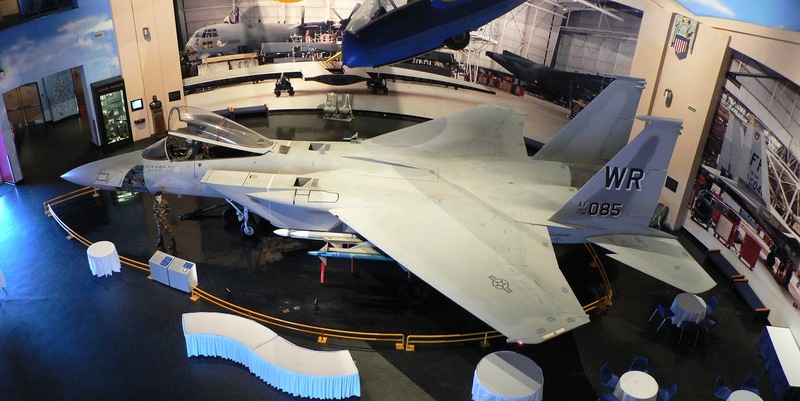 The F-15 is Featured in the Main Museum Building Hall. A man never forgets his first REALLY classified program. This C-130 is still doing better than the one tragically lost in Flight Test (Takes you to YouTube video of the accident).